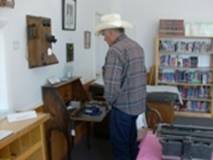 The Daggett County Centennial Museum was originally the Clay Basin School. It was originally completed in time for school in 1940. The school was purchased from DWR in 1997 and moved to Manila in 1998. Renovations took place and the Museum was opened in June of 2009. 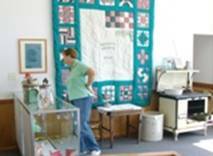 The Museum is operated by the Museum Board and run by volunteers. 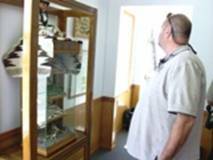 The Museum's displays are only available for viewing during the summer season. The Museum closes for the season after Labor Day weekend in September and is tentatively scheduled to re-open on Saturday for the Memorial Day weekend in May. 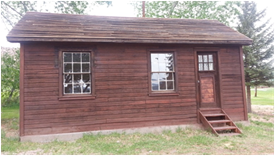 We are please to announce the completion of the "School Marms Cabin". Please come an see our new addition. The cabin was moved from Behunin Ranch, Burnt Fork to Daggett County Courthouse in the Fall of 2011. It was erected after the old school burned, it was completed in 1925. Mrs. Mary Ruble was one of the last teachers at the cabin. Thank you to Joe Jacobs, Daggett County Inmates and Roy "Buff" Mast for all of your hard work. The Museum has several Historical Books for sale. For more information or to order please contact Clerk/Treasurers Office at 435-784-3154. Call for the cost of shipping. We would be happy to ship directly to you. Opening on Memorial Day Weekend to Labor Day Weekend each year. The Museum is located behind the County Courthouse in Manila and is also accessible from the County Park. Some of the displays and books available at the Museum/Library.